This article describes energy and electricity production, consumption, import and export in Denmark. Denmark ranks as number 32 in the world among net exporters of crude oil. Denmark has considerable sources of oil and natural gas in the North Sea and ranked as number 32 in the world among net exporters of crude oil in 2008. Denmark expects to be self-sufficient with oil until 2050. However, gas resources are expected to decline, and production may decline below consumption in 2020, making imports necessary. A large but decreasing proportion of electricity is produced from coal, and hydropower and 3-4% nuclear power is imported while wind turbines supply the equivalent of about 42% of electricity demand by 2015 (see Wind power in Denmark). In February 2011 the Danish government announced the "Energy Strategy 2050" with the aim to be fully independent of fossil fuels by 2050, and a new government repeated the goal in 2015 despite public scepticism. The European Renewables Directive set a mandatory target at 20% share of energy from renewable sources by 2020 (EU combined). In 2012 the Danish government adopted a plan to increase the share of electricity production from wind to 50% by 2020, and to 84% in 2035. Denmark's electrical grid is connected by transmission lines to other European countries, and had (according to the World Economic Forum) the best energy security in the EU in 2013 although this had fallen to third in the EU by 2014. Denmark imports around 12% of its energy. In 1972, 92% of Denmark's energy consumption came from imported oil. The 1973 oil crisis forced Denmark to rethink its energy policy; in 1978 coal contributed 18%, and the Tvind wind turbine was built, along with the creation of a wind turbine industry. The 1979 energy crisis pushed further change, and in 1984 the North Sea natural gas projects began. The North Sea production of oil and gas made Denmark self-sufficient in 1997, peaking in 2005, and decreased below self-sufficiency by 2013. In 2015 Denmark produced 89% of its energy consumption of 720-756 PJ. The year 2014 was the warmest on record in Denmark, with the lowest number of degree days in history. A normal year has 2,906 while 2014 saw only 2,100 degree days. Since 2000, Denmark has increased Gross National Product and decreased energy consumption. Mtoe = 11.63 TWh. Primary energy includes energy losses. Fuel is not taxed for ships and planes to other countries. Coal and gas for electricity is not taxed. x tax". Carbon dioxide tax is 0.09 DKK/kWh for electricity. Fossil fuels are taxed at about 90 DKK/ton CO2. Energy taxes contributed 34 billion DKK in 2015, about 12% of overall taxing revenue. The money is a considerable income for the state, and changing the composition of the taxes towards a "greener" mix is difficult. According to a government official, the majority of taxes are not based on environment concerns, in contrast to the DKK 5 billion per year in PSO-money for cleaner energy, paid by electricity consumers to producers of clean electricity. These tolls are not available for government consumption. Fossil fuel consumption in Denmark. Coal power provided 48.0% of the electricity and 22.0% of the heat in district heating in Denmark in 2008; and in total provided 21.6% of total energy consumption (187 PJ out of 864 PJ). 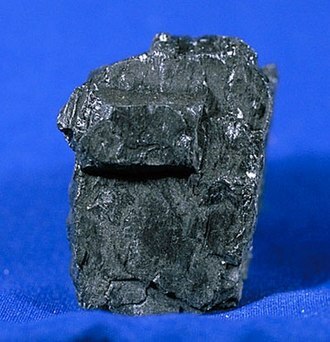 The coal is mainly imported from outside Europe. Consumption of coal was more than halved over the 10 years between 2004-2014. Coal constituted 41% of the mass fuels (not wind and sun) in 2015, and is expected to decrease to 14% in 2025, mostly replaced by biofuels. 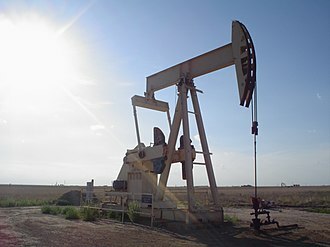 The production of crude oil fell from 523 PJ in 2010 to 470 PJ in 2011. As of May 2014, Denmark produced an average of 172 kbpd. Danish oil companies donate DKK 1 billion over 10 years to Technical University of Denmark to increase production. Danish oil reserves are expected to run out around 2047. Consumption fell from 315 to 306 PJ during 2011. Official statistics estimate 231,000 residences heated by oil in 2014 (down from 328,000 in 2013), but only 87,000 actually purchased oil during 2014. The production of natural gas fell from 307 PJ in 2010 to 265 PJ in 2011. Consumption fell from 187 to 157 PJ. CO2 emissions from energy production fell from 49.4 to 44.3 million tons, from 2010 to 2011, a decline of 10%. Denmark consumed 2.1 million tonnes of wood pellets in 2014, expected to increase by 1.2 million tonnes as more coal is replaced. They are mainly imported from the Baltic states and Russia. Denmark also burns wood chips and straw, mostly for heating. Denmark had 790 MW of photovoltaic capacity in late 2015, and already reached its year 2020 governmental goal of installing 200 MW in 2012. As of 2013, the total PV capacity from 90,000 private installations amounts to 500 MW. Danish energy sector players estimate that this development will result in 1000 MW by 2020 and 3400 MW by 2030. Solar heating is installed in some homes, and also used in district heating. Denmark has three geothermal district heating plants; a 7 MW in Thisted started in 1988, a 14 MW in Copenhagen started in 2005, and a 12 MW in Sønderborg in 2013. They may combine with biomass burning, but produce no electricity, as temperatures are too low. The electricity sector relies on fossil, nuclear and renewable energy: wind power, biogas, biomass and waste. No hydro power is produced domestically and other countries' hydro and thermal power is used for buffering Denmark's renewable generation. 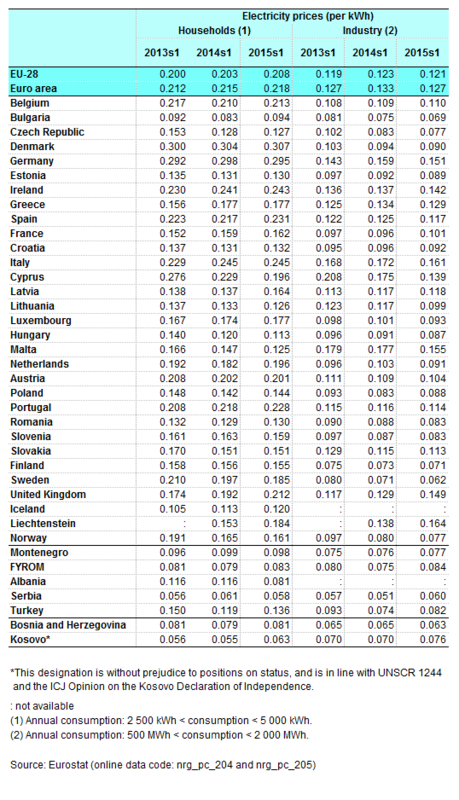 The average consumption of electricity per person was 0.8 GWh less than EU 15 average in 2008. Denmark invested in the wind power development in the 1970s and has been the top wind power country of the world ever since. Danish consumption of wind electricity has been highest in the world per person: 1,218 kWh in 2009. Denmark produced more wind power per person in 2009 than Spain or the UK produced nuclear power. Denmark has mediocre electricity costs (including about DKK 5 billion in costs for cleaner energy) in EU for industries at 9 eurocent/kWh, but general taxes increase the household price to the highest in Europe at 31 eurocent/kWh. Transmission costs are around 1c/kWh, and support regimes cost 2½ c/kWh in 2014. Wind provided 39% of the electricity generated in Denmark in 2014, and 42.1% of Denmark's total electricity consumption in 2015. Denmark is a long-time leader in wind energy, and as of May 2011[update] Denmark derives 3.1 percent of its Gross Domestic Product from renewable energy technology and energy efficiency, or around €6.5 billion ($9.4 billion). To encourage investment in wind power, families were offered a tax exemption for generating their own electricity within their own or an adjoining commune. While this could involve purchasing a turbine outright, more often families purchased shares in wind turbine cooperatives which in turn invested in community wind turbines. By 2004 over 150,000 Danes were either members of cooperatives or owned turbines, and about 5,500 turbines had been installed, although with greater private sector involvement the proportion owned by cooperatives had fallen to 75%. The production of nuclear energy has been banned in Denmark since 1985. In 2014 and 2015, (imported) nuclear power was 3-4% of electricity consumption in Denmark. An average of 10% of domestic energy consumption comes from imports from neighboring countries Sweden and Germany, which both generate nuclear power. In Sweden, about 40% of the energy is generated by nuclear power and in Germany less than 20% by nuclear power. In 2011, with imports of 2.9 TWh from Germany and 5.2 TWh from Sweden, about 3.5TWh used was from countries that generate nuclear power – nearly 11% of total final consumption. This fluctuates year to year, mainly due to NordPool prices, and Energinet.dk analysis showed 1% from countries that generate nuclear power in 2010, 7% in 2011 and 14% in 2012. Danish district heating plants use 100 Petajoule/year, mostly waste heat from thermal power plants burning coal, natural gas and biomass, but a small part of this consumption is from electrode boilers or heat pumps. Expansion of wind powered district heating is calculated to be economically efficient without taxes. The peak thermal load of district heating in Copenhagen is 2.5 GWth, and simulations suggest a potential heat pump would run 3,500 load-hours per year using sewage water as the heat reservoir. In 2013, Denmark imported 158,000 ton garbage for incineration in 10 district heating plants, increasing to 323,963 ton in 20 plants in 2015, about 10% of burnt waste. The pipe heat loss is 17%, at a value of DKK 150 million. New pipes have a heat loss of 6.5%. There are 60,000 km of pipes, serving 1.6 million households. Several towns use central solar heating, some with storage. Denmark aims to focus on intelligent battery systems (V2G) and plug-in vehicles in the transport sector. Tax revenue from vehicles was 28 billion DKK in 2014. Copenhagen has a target to be carbon-neutral by 2025, and has burned more biomass and less coal during 2004-2014. Aarhus aims to be carbon-neutral by 2030. ^ "EIA – International Energy Data and Analysis for Denmark". Tonto.eia.doe.gov. 15 May 2009. Retrieved 29 May 2009. ^ Unforeseen billions from North Sea Maritime, 4 December 2011. Accessed: 8 December 2011. ^ Andersen, Christian Meiniche. Gas supply 2011-2013 page 17 Energinet.dk. Accessed: 8 December 2011. ^ a b c ENERGISTATISTIK 2015, page 3. Quote: "2015 var præget af stor nettoelimport, hvilket hovedsageligt betød et kraftigt fald i forbruget af kul på 35,8%"
^ a b "Rekord lav CO2-udledning fra elforbrug i 2015 Archived 2016-03-20 at the Wayback Machine" Energinet.dk, 1 March 2015. ^ "More nuclear power flowing through Danish outlets". cphpost.dk. 3 September 2013. ^ a b "New record-breaking year for Danish wind power". Energinet.dk. 15 January 2016. Archived from the original on 25 January 2016. ^ a b Rasmussen, Jesper Nørskov. "Vindmøller slog rekord i 2014 Archived 2015-01-06 at the Wayback Machine" Energinet.dk, 6 January 2015. Accessed: 6 January 2015. ^ "Release of Danish Energy Strategy 2050". Danish Ministry of Climate and Energy. 24 February 2011. Retrieved 19 May 2011. ^ Danmark er længere med den grønne omstilling end danskerne ved Danish Energy Agency, 1 October 2015. Accessed: 24 January 2016. ^ "Deal secured on ambitious EU renewables law". EurActiv.com. 9 December 2008. Archived from the original on 2011-06-09. ^ Danish Wind Industry Association, Wind energy Denmark, n.d.
^ Gellert, Bjarne Christian. Electricity interconnections Archived 2013-02-09 at the Wayback Machine Energinet.dk, 22 August 2011. Accessed: 6 December 2011. ^ "Danish security of supply is number one in the EU" Energinet.dk, 11 December 2013. Accessed: 26 December 2013. ^ "Global Rankings", Accessed: 30 April 2015. ^ "INFOGRAPHIC: Can Germany's Energiewende ensure supply security?". EurActiv.com. Retrieved 1 February 2017. 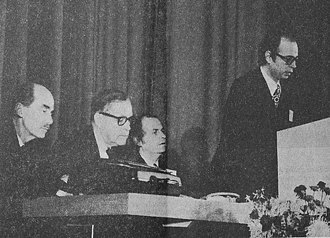 ^ "Energiomstilling 2050 : 1972". Danish Energy Agency. ^ "Energiomstilling 2050 : 1978". Danish Energy Agency. ^ "Energiomstilling 2050 : 1984". Danish Energy Agency. ^ "Energiomstilling 2050 : 1997". Danish Energy Agency. ^ "Energiomstilling 2050 : 2005". Danish Energy Agency. ^ David Roberts (12 March 2016). "Got Denmark envy? Wait until you hear about its energy policies". Vox. Retrieved 26 April 2016. ^ Bernth, Martin. 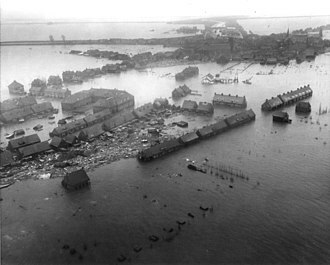 "Mildt vejr skærer 20 procent af varmeregningen" Ingeniøren, 5 January 2015. Accessed: 5 January 2015. ^ "CO2-afgiftsloven - Bekendtgørelse af lov om kuldioxidafgift af visse energiprodukter". retsinformation.dk. Retrieved 13 September 2016. ^ "Kulafgiftsloven". Danish Ministry of Taxation. 9 March 2016. Archived from the original on 4 April 2016. Retrieved 12 September 2016. ^ "Environmental Taxes in Denmark". Confédération Fiscale Européenne. Retrieved 26 April 2016. ^ a b "Fremskrivning af PSO-udgifter" page 6+17. Danish Energy Agency, 19 May 2014. Retrieved: 17 January 2015. ^ Hansen, Jens Morten. "Dänemark - Produktion und Kommunikation - Energie" (in German). The Royal Danish Ministry of Foreign Affairs. Archived from the original on September 27, 2007. 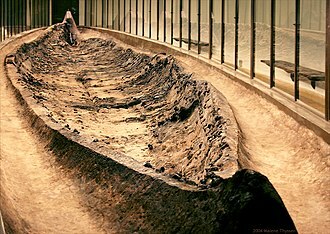 Retrieved 17 May 2010. ^ "Fuels". Energinet.dk. Retrieved 14 October 2016. ^ Danish Production of Oil, Gas and Water for May 2014 Danish Energy Agency, May 2014. Accessed: 26 June 2014. ^ "Teknologisk spredehagl skal klemme den sidste olie ud af Nordsøen". Ingeniøren. 8 September 2016. Retrieved 8 September 2016. ^ a b c Main energy statistics 2011 Danish Ministry of Climate and Energy, 20 March 2012. Accessed: 20 March 2012. ^ Wittrup, Sanne. "Halvdelen af landets oliefyr er forsvundet " Ingeniøren, 9 April 2015. Accessed: 9 April 2015. ^ Dal, Peter. Large drop in energy and CO2 Danish Ministry of Climate and Energy, 20 March 2012. Accessed: 20 March 2012. Quote: ""
^ "Follow the solar cells" Energinet.dk, 18 December 2013. Accessed: 26 December 2013. ^ a b Wittrup, Sanne (14 June 2015). "Verdens største damvarmelager indviet i Vojens". Ingeniøren. Archived from the original on 2015-10-19. Retrieved 2016-01-26. 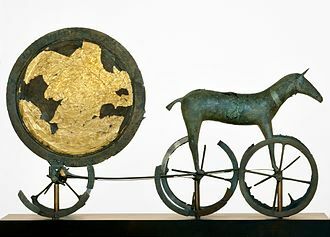 ^ "Geotermisk energi". Geotermisk energi. ^ "Geothermal Energy Use 2015 Country Update for Denmark" (PDF). ^ "Energistyrelsen". Danish Energy Agency. ^ "Energinet.dk holds tariffs down - PSO tariff rises" Energinet.dk, 11 December 2013. Accessed: 26 December 2013. ^ "Denmark breaks its own world record in wind energy". EurActiv - EU News & policy debates, across languages. ^ "Denmark Invests the Most in Clean Energy per GDP". yourolivebranch.org. Archived from the original on 16 May 2012. Retrieved 15 June 2012. ^ a b "Nuclear Energy in Denmark". World Nuclear Association. Retrieved 2016-02-03. ^ "A nuclear update for a Swedish energy summit". Energycentral. 2 October 2015. Retrieved 15 November 2016. ^ "Die Verantwortung wächst". Bundesverband der Energie- und Wasserwirtschaft. 16 December 2011. Retrieved 15 November 2016. ^ Wittrup, Sanne. "Dong: Vores kraftværker bruger allerede billig vindmøllestrøm i elpatroner" Ingeniøren, 15 January 2015. Retrieved: January 2015. ^ Blarke, Morten Boje. "Liste over el-drevne varmepumper i fjernvarmen" SmartVarme.dk, 12 February 2014. Retrieved: January 2015. 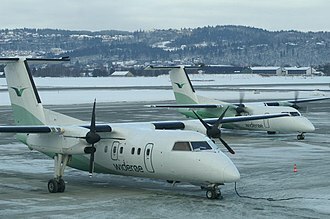 ^ Capion, Karsten. "Analyse nr. 9 - Mulighederne for den fremtidige fjernvarmeproduktion i decentrale områder Archived 2015-12-08 at the Wayback Machine" Danish Energy, 15 January 2014. Retrieved: 15 January 2015. ^ Blarke, Morten Boje. "Store eldrevne varmepumper[permanent dead link]" Aalborg University, 17 April 2013. Retrieved: January 2015. ^ Bach, Bjarne. "Integration of Heat Pumps in Greater Copenhagen" Technical University of Denmark, March 2014. Retrieved: January 2015. ^ Klimaråd: Affaldsimport vil belaste dansk CO2-regnskab Archived 2015-11-28 at the Wayback Machine 27 November 2015. ^ Mads Lorenzen (19 April 2016). "20 ud af 26 forbrændingsanlæg fylder ovnene med importeret affald". Ingeniøren. Retrieved 26 April 2016. ^ "Fjernvarmeværkerne har barberet ledningstabet kraftigt ned". ^ "Plug-in and Electrical Vehicles". EnergyMap.dk. Archived from the original on October 9, 2011. Retrieved 15 June 2012. ^ "Climate Target 2030". Go Green with Aarhus, City of Aarhus. Retrieved 28 July 2014. Wikimedia Commons has media related to Energy in Denmark. An electrical grid is an interconnected network for delivering electricity from suppliers to consumers. 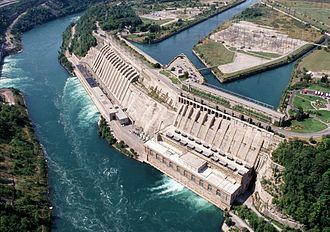 Power stations may be located near a source, at a dam site, or to take advantage of renewable energy sources. They are usually large to take advantage of the economies of scale. The electric power which is generated is stepped up to a voltage at which it connects to the electric power transmission network. The bulk power transmission network will move the power long distances, sometimes across international boundaries, on arrival at a substation, the power will be stepped down from a transmission level voltage to a distribution level voltage. As it exits the substation, it enters the distribution wiring, upon arrival at the service location, the power is stepped down again from the distribution voltage to the required service voltage. Electrical grids vary in size covering an single building through national grids which cover whole countries. Early electric energy was produced near the device or service requiring that energy, in the 1880s, electricity competed with steam and especially coal gas. Coal gas was first produced on premises but evolved into gasification plants that enjoyed economies of scale. In the industrialized world, cities had networks of piped gas, but gas lamps produced poor light, wasted heat, made rooms hot and smoky, and gave off hydrogen and carbon monoxide. 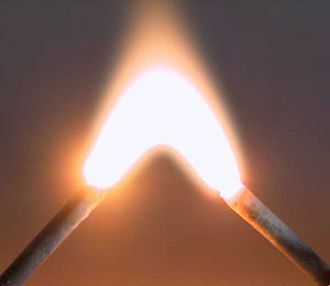 In the 1880s electric lighting soon became advantageous compared to gas lighting, Electric utility companies took advantage of economies of scale and moved to centralized power generation and system management. With long distance power transmission it became possible to interconnect stations to balance load, merz was appointed head of a Parliamentary Committee and his findings led to the Williamson Report of 1918, which in turn created the Electricity Supply Bill of 1919. The bill was the first step towards an integrated electricity system, the Electricity Act of 1926 led to the setting up of the National Grid. The Central Electricity Board standardized the nations electricity supply and established the first synchronized AC grid and this started operating as a national system, the National Grid, in 1938. Nuclear power is the use of nuclear reactions that release nuclear energy to generate heat, which most frequently is used in steam turbines to produce electricity in a nuclear power plant. The term includes nuclear fission, nuclear decay and nuclear fusion, since all electricity supplying technologies use cement, etc. during construction, emissions are yet to be brought to zero. Each result is contrasted with coal and fossil gas at 820 and 490 g CO2 eq/kWh, there is a social debate about nuclear power. Proponents, such as the World Nuclear Association and Environmentalists for Nuclear Energy, contend that nuclear power is a safe, such as Greenpeace International and NIRS, contend that nuclear power poses many threats to people and the environment. These include the Chernobyl disaster which occurred in 1986, the Fukushima Daiichi nuclear disaster, there have been some nuclear submarine accidents. Energy production from coal, natural gas and hydroelectricity has caused a number of fatalities per unit of energy generated due to air pollution. 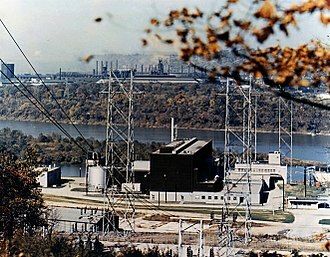 In 2015, Ten new reactors were connected to the grid, seven reactors were permanently shut down. 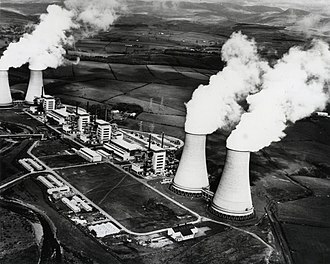 441 reactors had a net capacity of 382,855 megawatts of electricity. 67 new nuclear reactors were under construction, Most of the new activity is in China where there is an urgent need to control pollution from coal plants. In October 2016, Watts Bar 2 became the first new United States reactor to enter commercial operation since 1996. The same year, his doctoral student James Chadwick discovered the neutron, further work by Enrico Fermi in the 1930s focused on using slow neutrons to increase the effectiveness of induced radioactivity. Experiments bombarding uranium with neutrons led Fermi to believe he had created a new, transuranic element and they determined that the relatively tiny neutron split the nucleus of the massive uranium atoms into two roughly equal pieces, contradicting Fermi. Numerous scientists, including Leó Szilárd, who was one of the first, recognized that if fission reactions released additional neutrons, a self-sustaining nuclear chain reaction could result. A solar thermal collector collects heat by absorbing sunlight. A collector is a device for capturing solar radiation, Solar radiation is energy in the form of electromagnetic radiation from the infrared to the ultraviolet wavelengths. The quantity of solar energy striking the Earths surface averages about 1,000 watts per square meter under clear skies, depending upon weather conditions and orientation. The term solar collector commonly refers to hot water panels. Concentrated solar power plants use the more complex collectors to generate electricity by heating a fluid to drive a turbine connected to an electrical generator. Simple collectors are used in residential and commercial buildings for space heating. The first solar thermal collector designed for building roofs was patented by William H. Goettl, Solar collectors are either non-concentrating or concentrating. 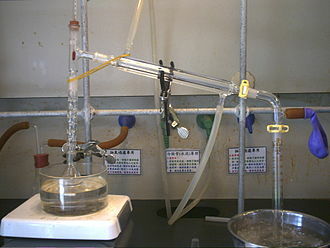 In the non-concentrating type, the area is the same as the absorber area. In these types the whole solar panel absorbs light, concentrating collectors have a bigger interceptor than absorber. Flat-plate and evacuated-tube solar collectors are used to heat for space heating. Flat-plate collectors, developed by Hottel and Whillier in the 1950s, are the most common type and they consist of a dark flat-plate absorber, a transparent cover that reduces heat losses, a heat-transport fluid to remove heat from the absorber, and a heat insulating backing. The absorber consists of a thin absorber sheet often backed by a grid or coil of fluid tubing placed in a casing with a glass or polycarbonate cover. In water heat panels, fluid is circulated through tubing to transfer heat from the absorber to an insulated water tank. This may be achieved directly or through a heat exchanger, most air heat fabricators and some water heat manufacturers have a completely flooded absorber consisting of two sheets of metal which the fluid passes between. Because the heat exchange area is greater they may be more efficient than traditional absorbers. Sunlight passes through the glazing and strikes the absorber plate, which heats up, the heat is transferred to liquid passing through pipes attached to the absorber plate. Tvind is the informal name of a confederation of private schools, humanitarian organizations, and businesses, founded as an alternative education school in Denmark circa 1970. The organization is controversial in Denmark, where it runs a number of schools primarily for troubled youth, some journalists, as well as former students and employees, have described the organization and its controlling body, the Teachers Group, as a political cult. In 2013, several of Tvinds senior members were sentenced by in absentia to prison in Denmark for suspected tax evasion and embezzlement, as of August 2016, the defendants, who are wanted by Interpol, are believed to be hiding in Mexico. 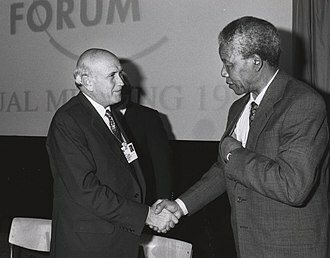 Following a provision of the Danish constitution that allows any group to form a school and receive government funding, over time, the groups financial dealings grew to encompass various non-profit and commercial enterprises such as African AIDS work, South American plantations and second-hand clothing dealers. Some former members of the group have made allegations that Tvind is run as an authoritarian cult and its purported leader, Mogens Amdi Petersen, had been in hiding since the 1970s and reappeared in 2002 when apprehended on charges of fraud and tax evasion. As of August 2016, Petersen and a group of the leaders are facing charges of fraud in Denmark. Tvind was founded c.1970 by Petersen, a young, Petersen is said to have collected about 40 followers and established a government-funded alternative school system for troubled youth in Denmark. 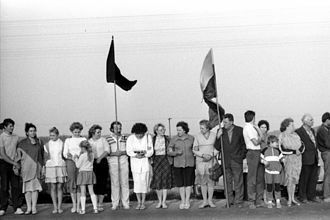 In 1972 the Tvind base was founded in West Jutland on a plot of farming land called Tvind, at that time, all of Tvinds schools received public subsidies in accordance with the very liberal education laws in Denmark. It is located in the countryside near Ulfborg in Western Jutland, more Tvind Schools began to emerge and after 25 years more than 30 schools have been established all over Denmark and some abroad. An estimated 40,000 children and adults have attended Tvind Schools since the first school was established in 1970, Tvind soon became a popular center for youth counter culture in the 1970s and 1980s. In 2008, The European Association for Renewable Energy awarded Tvind the European Solar Prize for education, Tvindkraft has since supplied the energy needed for the schools in Tvind. The building of Tvindkraft inspired and gave rise to a wind mill industry in Denmark. From 1970 to 1996, the Tvind schools received government financial support, official support of The Necessary Teacher Training College, Tvinds volunteer training school in Denmark, had ended four years earlier, in 1992. A Special Act passed in 1996 by the Danish Parliament discontinued the official support beginning January 1,1997 and this act prevented the Tvind schools from receiving such support under the general rules, which they otherwise would have been entitled to. In 1999, the Danish Supreme Court — in a unanimous,11 judge ruling — set aside the Special Act on the grounds that it had circumvented the Danish Constitution. The controversial decision was the first time in the history of Denmarks Constitution that the Supreme Court had ever discarded an act as being unconstitutional, despite the Courts ruling, the Tvind schools never regained financial support from the Danish government. Those schools were named The Small Schools because of smaller units with different programs. District heating is a system for distributing heat generated in a centralized location for residential and commercial heating requirements such as space heating and water heating. District heating plants can provide higher efficiencies and better control than localized boilers. A combination of CHP and centralized heat pumps are used in the Stockholm multi energy system, the core element of many district heating systems is a heat-only boiler station. Additionally a cogeneration plant is added in parallel with the boilers. Both have in common that they are based on combustion of primary energy carriers. In the case of a fossil fueled cogeneration plant, the output is typically sized to meet half of the peak heat load. The boiler capacity will be able to meet the entire heat demand unaided and it is not economic to size the cogeneration plant alone to be able to meet the full heat load. In the New York City steam system, that is around 2.5 GW, Germany has the largest amount of CHP in Europe. The combination of cogeneration and district heating is very energy efficient, a simple thermal power station can be 20–35% efficient, whereas a more advanced facility with the ability to recover waste heat can reach total energy efficiency of nearly 80%. Some may exceed 100% based on the heating value by condensing the flue gas as well. 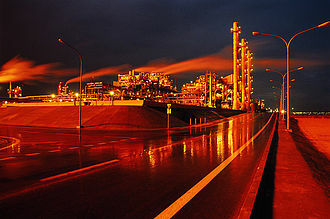 Waste heat from nuclear plants is sometimes used for district heating. The principles for a combination of cogeneration and district heating applies the same for nuclear as it does for a thermal power station. Russia has several cogeneration nuclear plants which together provided 11.4 PJ of district heat in 2005, Russian nuclear district heating is planned to nearly triple within a decade as new plants are built. Other nuclear-powered heating from cogeneration plants are in Ukraine, the Czech Republic, Hungary, one use of nuclear heat generation was with the Ågesta Nuclear Power Plant in Sweden closed in 1974. 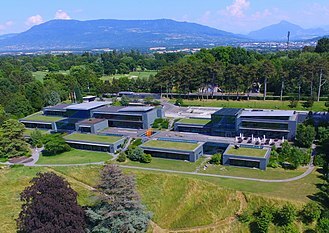 In Switzerland, the Beznau Nuclear Power Plant provides heat to about 20,000 people, history Geothermal district heating was used in Pompeii, and in Chaudes-Aigues since the 14th Century. In 1890, the first wells were drilled to access a hot water resource outside of Boise, in 1892, after routing the water to homes and businesses in the area via a wooden pipeline, the first geothermal district heating system was created. Electricity is the set of physical phenomena associated with the presence of electric charge. Although initially considered a separate to magnetism, since the development of Maxwells Equations both are recognized as part of a single phenomenon, electromagnetism. Various common phenomena are related to electricity, including lightning, static electricity, electric heating, electric discharges, in addition, electricity is at the heart of many modern technologies. The presence of a charge, which can be either positive or negative. On the other hand, the movement of charges, which is known as electric current. When a charge is placed in a location with non-zero electric field, the magnitude of this force is given by Coulombs Law. Thus, if that charge were to move, the field would be doing work on the electric charge. Electrical phenomena have been studied since antiquity, though progress in theoretical understanding remained slow until the seventeenth and eighteenth centuries. Even then, practical applications for electricity were few, and it would not be until the nineteenth century that engineers were able to put it to industrial and residential use. The rapid expansion in electrical technology at this time transformed industry, electricitys extraordinary versatility means it can be put to an almost limitless set of applications which include transport, lighting and computation. Electrical power is now the backbone of modern industrial society, long before any knowledge of electricity existed, people were aware of shocks from electric fish. Ancient Egyptian texts dating from 2750 BCE referred to these fish as the Thunderer of the Nile, Electric fish were again reported millennia by ancient Greek and Arabic naturalists and physicians. Patients suffering from such as gout or headache were directed to touch electric fish in the hope that the powerful jolt might cure them. Ancient cultures around the Mediterranean knew that certain objects, such as rods of amber, Thales was incorrect in believing the attraction was due to a magnetic effect, but science would prove a link between magnetism and electricity. He coined the New Latin word electricus to refer to the property of attracting small objects after being rubbed and this association gave rise to the English words electric and electricity, which made their first appearance in print in Thomas Brownes Pseudodoxia Epidemica of 1646. Wind power is the use of air flow through wind turbines to mechanically power generators for electric power. The net effects on the environment are far less problematic than those of power sources. Wind farms consist of individual wind turbines which are connected to the electric power transmission network. Onshore wind is a source of electric power, competitive with or in many places cheaper than coal or gas plants. 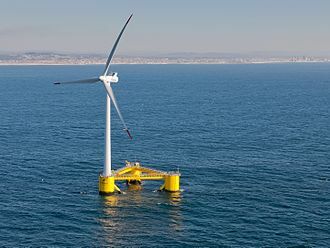 Offshore wind is steadier and stronger than on land, and offshore farms have less visual impact, small onshore wind farms can feed some energy into the grid or provide electric power to isolated off-grid locations. Wind power gives variable power which is consistent from year to year. It is therefore used in conjunction with other power sources to give a reliable supply. As the proportion of power in a region increases, a need to upgrade the grid. In addition, weather forecasting permits the power network to be readied for the predictable variations in production that occur. As of 2015, Denmark generates 40% of its power from wind. In 2014 global wind power capacity expanded 16% to 369,553 MW, yearly wind energy production is growing rapidly and has reached around 4% of worldwide electric power usage,11. 4% in the EU. Wind power has been used as long as humans have put sails into the wind, for more than two millennia wind-powered machines have ground grain and pumped water. Wind power was available and not confined to the banks of fast-flowing streams, or later. Wind-powered pumps drained the polders of the Netherlands, and in regions such as the American mid-west or the Australian outback, wind pumps provided water for live stock. The first windmill used for the production of power was built in Scotland in July 1887 by Prof James Blyth of Andersons College. Blyth offered the surplus power to the people of Marykirk for lighting the main street, however. The Brush wind turbine had a rotor 17 metres in diameter and was mounted on an 18 metres tower, although large by todays standards, the machine was only rated at 12 kW. An excise or excise tax is an inland tax on the sale, or production for sale, of specific goods or a tax on a good produced for sale, or sold, within a country or licenses for specific activities. Excises are distinguished from customs duties, which are taxes on importation, excises are inland taxes, whereas customs duties are border taxes. An excise is considered a tax, meaning that the producer or seller who pays the tax to the government is expected to try to recover or shift the tax by raising the price paid by the buyer. Excises are typically imposed in addition to another indirect tax such as a tax or value added tax. Typical examples of excise duties are taxes on gasoline and other fuels, the etymology of the word excise is derived from the Dutch accijns, which is presumed to come from the Latin accensare, meaning simply to tax. Regulatory and legal definitions of excise vary by country, for example, In India, an excise is described as an indirect tax levied and collected on the goods manufactured in India. Include alcohol and petroleum and alternative fuels, in Australia, the meaning of excise is not merely academic, but has been the subject of numerous court cases. Samuel Johnson was less flattering in his 1755 dictionary, EXCISE, a hateful tax levied upon commodities, and adjudged not by the common judges of property, but wretches hired by those to whom excise is paid. Monies raised through excise may be earmarked for redress of specific social costs commonly associated with the product or service being taxed, tobacco tax revenues, for example, might be spent on government anti-smoking campaigns. Excise duties or taxes often serve political as well as financial ends, public safety and health, public morals, environmental protection, and national defense are all rationales for the imposition of an excise. Punitive Many US states impose taxes on illegal drugs and these are the three main targets of excise taxation in most countries around the world. They are everyday items of mass usage which bring significant revenue for governments, the first two are considered to be legal drugs, which are a cause of many illnesses, which are used by large swathes of the population, both being widely recognized as addictive. Working for Westinghouse, William Stanley Jr. spent his time recovering from illness in Great Barrington installing what is considered the world's first practical AC transformer system. Gasoline ration stamps printed by the Bureau of Engraving and Printing in 1974, but not used. 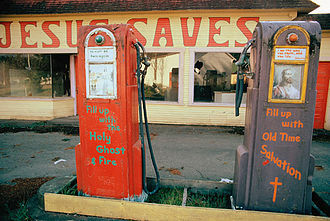 Gas stations abandoned during the crisis were sometimes used for other purposes. This station at Potlatch, Washington, was turned into a revival hall. A woman uses wood in a fireplace for heat. A newspaper headline before her tells of the community's lack of heating oil. Central solar heating plant at Marstal, Denmark. It covers more than half of Marstal's heat consumption. 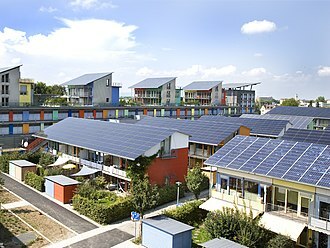 The Solar Settlement, a sustainable housing community project in Freiburg, Germany. Photovoltaic SUDI shade is an autonomous and mobile station in France that provides energy for electric cars using solar energy. Breaking waves at the north sea coast of Denmark in the evening of July 9, 2015 as the new record in peak capacity was reached. Pellet truck being filled at a plant in Germany. A brownout near Tokyo Tower in Tokyo, Japan. Toronto during the Northeast blackout of 2003, which required black-starting of generating stations. 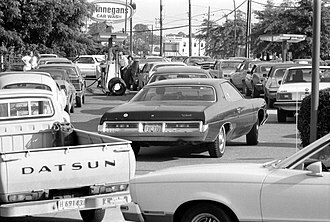 Line at a gas station in Maryland, United States, June 15, 1979. Primary energy sources are transformed by the energy sector to generate energy carriers. District heating accumulation tower from Theiss near Krems an der Donau in Lower Austria with a thermal capacity of 2 GWh. A U.S. Navy F/A-18 Super Hornet displaying an "Energy Security" logo.